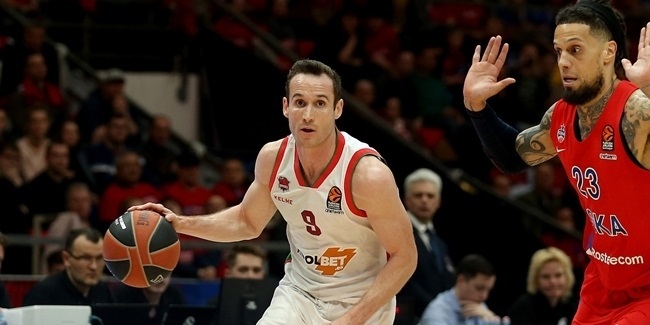 With his team needing to get back on the winning track in a tight Turkish Airlines EuroLeague Playoffs race, Kim Tillie had perfect timing for a career-night and close-to-perfect performance. 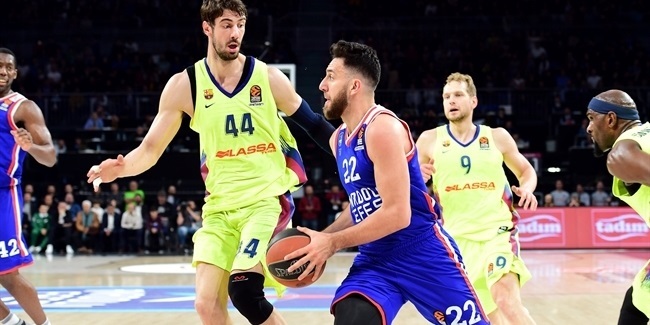 The Baskonia Vitoria Gasteiz forward gave his side a huge boost in 87-74 win over EA7 Emporio Armani Milan, and in the process earned his first-ever MVP of honor for Round 24. Tillie finished with a career-high 19 points, making 4 of 5 two-point shots and a perfect 3 of 3 from three-point distance. That single missed two-point shot was the only negative in Tillie's stat line. He also made both of his free throw attempts, pulled down 5 rebounds, stole 3 balls, matched his career-best with 3 assists, and drew a pair of fouls. He had no personal fouls, turnovers or blocks against, accumulating a career-high performance index rating of 31, which also shattered his previous best of 21. 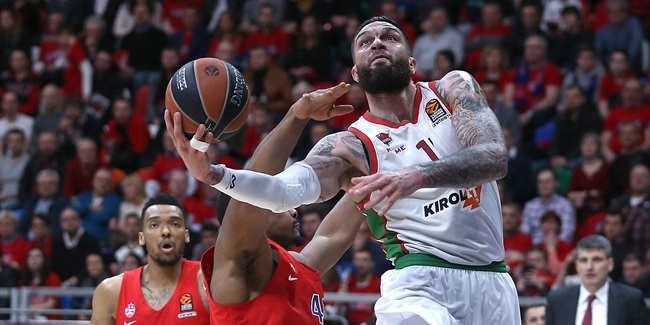 Two players – Derrick Brown of Anadolu Efes Istanbul and Chris Singleton of Panathinaikos Superfoods Athens – were just one index point behind Tillie, sharing the second-best PIR of Round 24. In a 92-99 overtime win against Unics Kazan, Brown matched his career-high with 24 points, adding 5 rebounds, 2 assists and 4 fouls drawn for an index rating of 30. Accumulating the same PIR of 30, but in a loss, was Panathinaikos center Singleton, who scored 23 points, shot 4-for-5 from three-point distance and made 4 of 6 two-point shots in 77-72 road defeat against Darussafaka Dogus Istanbul. Singleton also grabbed 6 rebounds, blocked 3 shots and dished 1 assist. Fourth place among the top performances in Round 24 belonged to Ekpe Udoh, who had a stellar Thursday night for Fenerbahce Istanbul in its 67-76 road win over Zalgiris Kaunas. Udoh was everywhere with 16 points, 7 rebounds, a career-high 5 assists and 4 blocks. His teammate Bogdan Bogdanovic rounded out the top five performers of the week, scoring 14 points, making 7 steals and drawing 8 fouls, in addition to 4 rebounds and 2 assists, all good for a PIR of 26. Derrick Brown and Darussafaka's Bradley Wanamaker topped all scorers in eight games of this round, each scoring 24 points. It matched a career-high for Brown, who now enters the Top 10 in scoring average this season with 13.3 points per game, while Wanamaker ranks sixth with 15.5. Keith Langford of Unics remains the season-long scoring leader, averaging 22.3 points. Galatasaray Odeabank Istanbul big man Tibor Pleiss had 12 rebounds in an 87-84 win over Real Madrid to lead all players this week. Baskonia big man Johannes Voigtmann jumped to the top of rebounding charts, averaging 7.7 boards for the season. Voigtmann's teammate, point guard Shane Larkin, was the only player to accumulate double-digit assists in Round 24. Larkin dished 11 of them in his team's win over Milan. CSKA Moscow playmaker Milos Teodosic is this season's overall leader with 7.3 per game. Bogdan Bogdanovic's 7 steals were the most for any EuroLeague in a single game over the past two seasons. Charles Jenkins of Crvena Zvezda mts Belgrade leads the competition with 2 steals per game this season. Ekpe Udoh's 4 blocked shots led all players in Round 24. Udoh increased his lead among the top shot blockers this season and is now averaging 2.3 per game. The only two double-doubles in Round 24 belonged to Latavious Williams of Unics, who posted 16 points and 10 rebounds, and Larkin, who had 13 points and 11 assists.